On Second Attempt, SpaceX Launches Rocket At NASA's Historic Kennedy Space Center : The Two-Way SpaceX scrubbed a launch attempt Saturday at NASA's Launch Complex 39A, site of the shuttle program and the mission that first sent humans to the moon. Their second try succeeded Sunday. SpaceX's Falcon 9 rocket sits on the launch pad Saturday at Kennedy Space Center in Florida. SpaceX scrubbed the Saturday launch due to a technical issue. The company is tried again — and succeeded — on Sunday. To paraphrase an age-old saying: If at first you don't succeed, well, dust off the historic launch pad and try another liftoff. Not as catchy as the original, perhaps, but certainly fitting for SpaceX, which succeeded Sunday on its second launch attempt at NASA's Launch Complex 39A, at Kennedy Space Center in Florida. 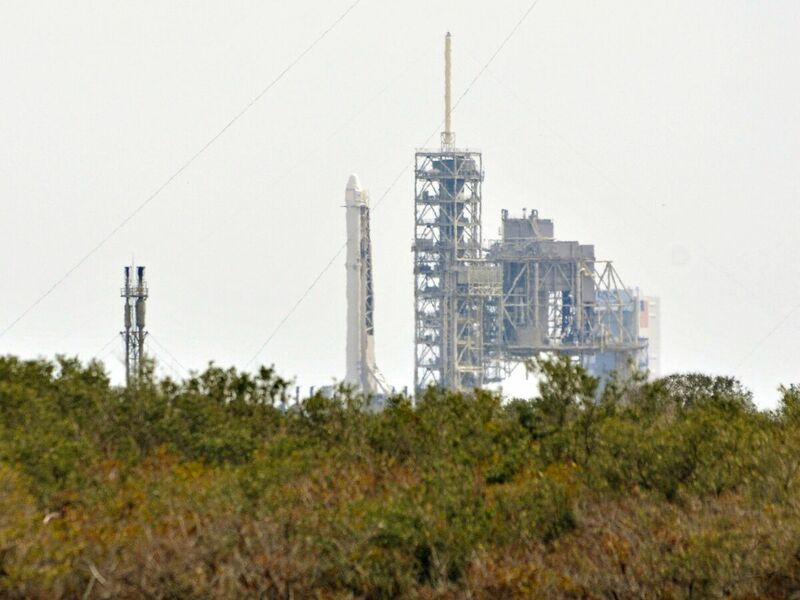 The first attempt, scrubbed Saturday with just 13 seconds before liftoff, was foiled by concerns over an anomaly discovered in the rocket's steering system. The issue was "99% likely to be fine," Elon Musk, founder of the private space company, tweeted Saturday, "but that 1% chance isn't worth rolling the dice. Better to wait a day." On Sunday, however, the launch went smoothly. Not only did SpaceX's Falcon 9 rocket lift off without a hitch, its first stage also returned to land right back on a platform on Earth. Shortly afterward, the Dragon spacecraft it was carrying detached as planned from the rocket. While there's nothing particularly rare about the 5,500 pounds of cargo strapped into that spacecraft — which is destined for the International Space Station — the pad it took off from has quite a backstory: Launch Complex 39A was the site that sent the first humans to the moon in the 1969 Apollo 11 mission. It was the pad for a number of NASA's most important missions — from its early days sending people to space, to the three decades of the space shuttle program. Now the pad, which hadn't been used since that program ended in 2011, is getting dusted off for a new era "as a spaceport open for use by public — and commercial — missions to space," NPR's Rae Ellen Bichell reported for our Newscast unit. "Science investigations launching on Dragon include commercial and academic research investigations that will enable researchers to advance their knowledge of the medical, psychological and biomedical challenges astronauts face during long-duration spaceflight. "One experiment will use the microgravity environment to grow stem cells that are of sufficient quality and quantity to use in the treatment of patients who have suffered a stroke. A Merck Research Labs investigation will test growth in microgravity of antibodies important for fighting a wide range of human diseases, including cancer." Reuters reports that NASA is also carefully monitoring the launch by SpaceX, which it "hired to fly cargo to the station after the shuttle program ended." The news service says NASA wants "to learn more about SpaceX's operations before it clears the company to fly NASA astronauts on SpaceX rockets."